so after a few weeks of tossing around the idea of getting a part-time job, andebobandy has decided to go pro, though, to be honest, i have no idea how to do this. my first stop was a website, named as it could only be named: andebobandy.com. so now keeping track of my startup cost, i'm in the hole $90 bucks. what will you sell at andebobandy.com, one might ask. well, i'll tell you. i haven't quite gotten that entirely ironed out yet. 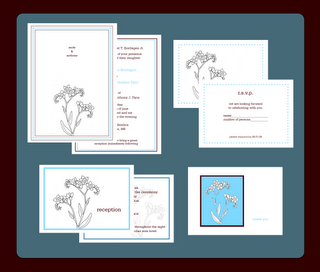 i am hoping to present a combination of skill/services, like wedding invitation design and web sites, and products, like cute notepads and other writing/paper products. right now, i'm still getting pricings and setting up pages, like the one below, that display work i've already done. these are the wedding invitations that i designed for anthony and i, after searching high and low for wedding invites that didn't make me want to puke. of course, for sentimental selfish reasons, these will never be available to anyone again. so, i've got my first official andebobandy pro appointment this week to discuss the needs of a certain mister g8s for a suitable web site to display his work, though i could never charge gates for anything like that. i'll likely stick him with a little branding, maybe a little link back to me. hopefully, he'll let me do it, the site and the link, and double hopefully, he'll love it in the end. p.s. honestly, is it way too much, this love affair i have with brown and blue? i'm pretty sure it'll pass. i actually am staring to like a lot more burnt orange these days. The invitations are gorgeous! I wish you had been around when we got married! urs were so boring because I hated all the non-white ones. But seriously, Ande, I'm excited to see andebobandy.com in all its glory. Don't know if you've settled on an online merchant/cart service, but take a look at Volusion (www.volusion.com). I have absolutely no vested interest in them, but I briefly considered adding an online shopping portal for my company's website and demoed this service and thought they were good - inexpensive and easy to use. (We didn't go ahead with the plan since we sell research report and this was geared towards physical products). Also, check out shop.org and InternetRetailer.com - both excellent resources for learning how to build an online retail presence. i have nothing to add except that i am currently *also* obsessed with brown and blue.